Children can be born with multiple congenital anomalies that can range from mild to severe to life threatening. Infants born with severe anomalies (e.g., anencephaly, trisomy 13, trisomy 18, or inoperable congenital heart defects) often die. Not all congenital anomalies are serious, and many can be corrected with treatment. 1Demographics and Risk Indicators Working Group, C.C.A.S.N., Public Health Agency of Canada. 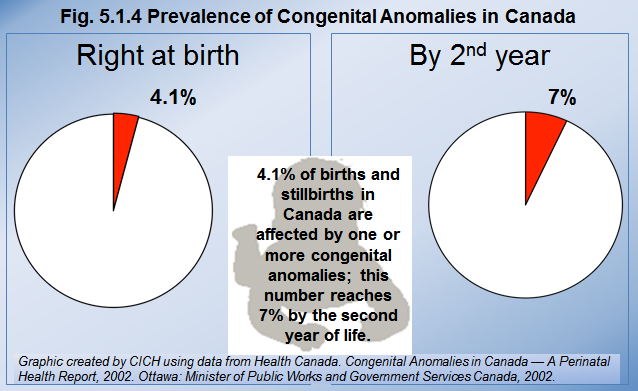 Congenital Anomalies Surveillance in Canada: Results of a 2006–2007 Survey on Availability of Selected Data Variables in Canadian Provinces and Territories. Ottawa: Public Health Agency of Canada; 2010.